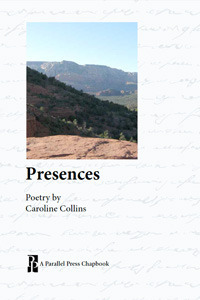 Presences by Caroline Collins. Parallel Press, 2014. She does understand death, after all, as is clear from her eulogies for Black Hawk, the Cherokees of New Echota, and even Me-she-thi-po-wi (the big river) itself. There is no need for her to inject any pathos into the story of Black Hawk — and she does not. Yet it is hard to confront the tragedy at the intersection of native peoples with “my kind” and not resent the blood-soaked, word-staked betrayal that Black Hawk and his people endured. its promises like limbs that never heal. to shred the garment of dream. Collins is an Illinoisan transplanted to Georgia and part of her identification with Black Hawk is their shared longing for home. this ancient, mud-thick, fish-rank river. Every poem in Collins’ Presences acknowledges the Midwestern prairie, its treacherous weather, its torn body, its “scant consolation.” The poet has accepted the truth of the prairie and is at peace with it, as Black Hawk was when he journeyed across the water.